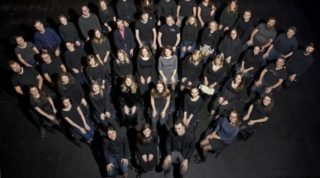 The Latvian chamber music trio Art-i-Shock has now been performing for seven years, and with their somewhat uncommon lineup (piano, cello, and percussion), not to mention eagerness to perform new and experimental works, have inspired many Latvian composers to compose especially for them. The trio gathered together and recorded some of their favorite compositions and, in 2017, released their debut album, simply entitled Contemporary Chamber Music from Latvia, which was released by the Latvian national record label Skani. Art-i-Shock, made up of cellist Guna Šnē, Elīna Endzele on percussion and pianist Agnese Egliņa, formed in 2011, and have since become one of the premiere performers and interpreters of not just modern music, but they also arrange music from throughout history. The album, a collection of seven chamber music works of a wide variety and styles, reveals the many facets and diversity of modern Latvian academic music, from melodic works to radical experimentations. The composers represented are of varied generations and in varied styles, and all the works are adeptly and expertly performed by the trio. It is immediately clear from the first few seconds of the album that this will not be an ordinary album of music. Endzele’s drums introduce the first composition, ‘Voltāža’ (Voltage) by Platons Buravickis, which are then joined by harsh cello sounds and bursts of piano. As per the composer the work is ‘a message about the pressure that acts upon a person’. Indeed, the work is full of tension, and the ensemble maintains this energy throughout the work, particularly in Egliņa’s tumbling piano phrases. After that anxious beginning, there is a small respite in composer Georgs Pelēcis’ ‘Pieneņu lauks’ (Field of Dandelions), a more melodic work where Šnē’s cello and Endzele’s vibraphone, and, later in the work, Egliņa’s piano, take turns in the forefront to provide a musical flowery landscape. Crashes and sudden bursts of sound are an integral part of composer Linda Leimane’s ‘Silhouettes. Behaviors’, a particularly challenging work for both the performers and listeners. As per the composer, the goal was to create ‘something alive, organic and plastic’, and with these various sounds the Trio creates an engrossing sonic journey. Perhaps the most ambitious work on the record is composer Kristaps Pētersons’ ‘Z.I.E.M.A.’ (or – Zigzagging Images and the Elements of the Melancholic Actuality), where the trio are joined by DJ Monsta on scratch and the composer himself on double bass. This is a particularly dense and complex work, with many sound effects and musical themes, and it is most helpful that the CD booklet includes a minute by minute breakdown of the compositions, with sections like ‘Leaving Gas Station Scene. Night’ and ‘Killing Scene. Late Morning’. As this is more of a theatrical work, Art-i-Shock set the stage with their evocative performances, while ghostly voices quote Emily Brontë, Shakespeare, and Wilhelm Müller. The CD also contains performances of compositions by Andris Vecumnieks, Rihards Dubra, and Zigmārs Liepiņš. Their work has not gone unnoticed; it is not particularly surprising that this CD was awarded the Zelta mikrofons award for best classical music album in 2017. The trio continues to work with many Latvian composers and premiere new works. The CD booklet is full of extensive notes on the group and the compositions in both Latvian and English. These notes are particularly helpful with understanding the compositions and their meanings, and one gets a sense that the composers find it both an honor and a challenge to compose for Art-i-Shock. 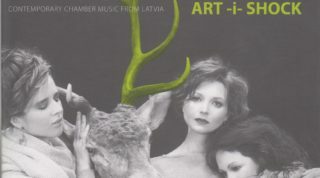 Contemporary Chamber Music from Latvia provides for conclusive documentation of the talents and abilities of the trio Art-i-Shock. Certainly, many of the works on the record are very modern and make for challenging listening, as they are often discordant and non-melodic, but still serve to create intricate musical paintings. The releases by the Skani label continues to reveal the many varied aspects of modern Latvian academic music, and Art-i-Shock are one of the most exemplary and innovative Latvian chamber music ensembles. For further information, please visit the Art-i-Shock website and the Skani music label website.